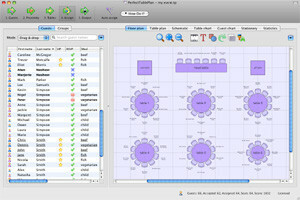 PerfectTablePlan 3.0.8 is food & drink software developed by Oryx Digital Ltd.
PerfectTablePlan is the quick and easy way to produce a table plan for your wedding, party or event. Just add information about your guests (including who should sit near who), decide the sizes and shapes of the tables and click on the automatic layout button. PerfectTablePlan can also recalculate a new table plan if you get cancellations, saving you a lot of stress. It is so much easier than spending hours scribbling on bits of paper! PerfectTablePlan 3.0.8 supports English interface languages and works with Mac. We have tested PerfectTablePlan 3.0.8 for spyware and adware modules. The software is absolutely safe to install. We has completely tested food & drink software PerfectTablePlan 3.0.8 many times, written and published the interesting article and uploaded installation file (6241K) to our fast server. Downloading PerfectTablePlan 3.0.8 will take minute if you use fast ADSL connection. The Essential Wedding Planner planning software, an easy-to-use application to help keep your wedding information organized.